A Thai-style private resort set amid the palm trees of grand Bahama could seem a clash of cultures, yet as Julia marozzi explains, all is harmony at the exclusive Nandana retreat. Pirates and pearls, ‘pieces of eight’ and peril at sea – from the mid-15th century, when the Spanish claimed Grand Bahama, right until the 1940s, the island has been known throughout its history more as a backdrop for the likes of Blackbeard, Captain Kidd and Henry Morgan than as the ultimate tourist paradise. When the Spanish arrived in 1492, there was barely a footprint on the beaches. The Lucayans were enslaved and transported to work the gold and silver mines of Hispaniola and Cuba, and the pearl fisheries of Margarita, near Trinidad. The conquerers gave the island the name ‘Gran Bajamar’ – great shallows – a term that eventually became the basis for The Islands of The Bahamas themselves, with reefs that were perfect for running vessels aground. The Spanish then promptly ignored Grand Bahama Island. Once in a while, a ship would drop anchor, then sail off towards Europe or South America. So many ships would collide with the reefs that ‘wrecking’ became a main way of making a living for the few inhabitants, most of whom lived at West End. It wasn’t unheard of for the townspeople to lure ships onto the reef with a well-placed lantern at night. Though Great Britain claimed the islands in 1670, up until the mid-19th century Grand Bahama Island was largely left alone by the outside world. There were plenty of sails on the horizon as ships came and went through the Caribbean, but more often than not they passed by. That all changed by 1861, when the American Civil War meant that the sugar, cotton and weapons essential to the war effort were commanding hefty prices as they were hauled out of West End by smugglers to the southern states of America. The short burst of prosperity set a precedent – from then on, Grand Bahama has been linked inextricably to the US. History has not only caught up with the island, it is being made regularly in the shape of new and alluring places to visit on Grand Bahama. The latest is Nandana, a Thai-style private resort in West End with just five one-bedroom suites, a full staff (including chef and masseuse), a 36m-long infinity pool and an adjacent landing strip. We all yearn now to put the days of the Great Recession squarely behind us. We yearn for a taste of the Good Old Days, when black credit cards were as common as supermarket loyalty cards are today and the words ‘uber-luxe’ served as a reminder of how good the good life can be. When you arrive back, enjoy a pre-dinner massage followed by sunset cocktails along the infinity pool. At night, put on your poker face at the nearby casino or heat up the evening with a walk on the moonlit beach. Anchored by an a 1,650m2 beach house, Nandana is the perfect escape for a decade dedicated to discreet decadence. The soaring main house has 12m-high ceilings and a wall of sliding glass doors opening to an expansive veranda and a 120-foot infinity pool overlooking the sea. The five one-bedroom suites surrounding the main house include two 90m2 beachfront pavilions, two garden bangalas (bungalows) and a 180m2 ‘safari- style’ canopy suite. 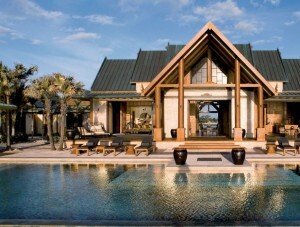 Nandana (‘paradise’ in Sanskrit) is challenging the traditional notion of an exclusive island retreat. While utterly private, the resort offers guests the luxe trappings of a five-star hotel with the discerning service and intimate environs of an opulent private home. At the centre is the Great Hall – where a wall of sliding-glass doors opens to an expansive veranda that leads to the glimmering infinity pool overlooking the sea. 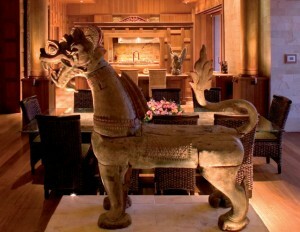 Design details include Burmese teak wood floors, and walls of Balinese limestone and Italian marble fittings. More than 300 palm trees and tropical plants surround the property, which sits directly on the Atlantic Ocean with spectacular 180-degree views. (only 30 minutes from Miami) and a deep-water canal leads to two sheltered, on-site docks, which are able to harbour a pair of 30m yachts. Then there is the world-class guest service. On-property staff provide the services of an estate manager, concierge, chef, masseuse, personal housekeeper, butler, chauffeur and boat captain. Every detail, from pillow-top beds with fine Italian linens to gourmet menus tailor-made to guest preferences, has been designed for a totally relaxing and completely private vacation. 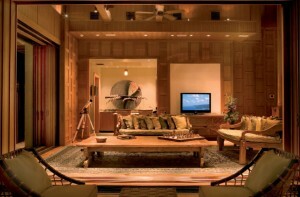 It’s not just about fabulous accommodations indoors, Nandana also offers sports and a variety of outdoor activities. From deep-sea fishing aboard the 13m sport yacht, ‘Lioness’, to shark diving, to private flights to Bimini, to channelling your inner Masters-winning golfer at the 18-hole Jack Nicklaus-designed golf course, there’s a hefty dose of adventure at this private paradise. When you arrive back, enjoy a pre-dinner massage followed by sunset cocktails along the infinity pool. At night, put on your poker face at the nearby casino or heat up the evening with a walk on the moonlit beach. Additional amenities include a 13m deep-sea fishing yacht and luxury 6m tender; private guided charters for deep-sea fishing and world-class bonefishing; Yamaha WaveRunners©; Suzuki all-terrain vehicles; in-house Scuba equipment; on-property golf carts; fully equipped in-home gym; in-house spa with sauna, private masseuse and custom treatment programme; wood panelled library and game room; home office with global connectivity; high-speed Wi-Fi throughout; flat-screen satellite and cable TV, iPod docking stations and one-touch electronics control. It’s all a far cry from the days of Prohibition, when a second smuggling boom again brought wealth to Grand Bahama in the 1920s, before the island became a mecca for tourism. If the residents of West End had known that the 18th Amendment would bring unheard-of prosperity to their village, they probably would have lobbied for it themselves. Prohibition brought warehouses, distilleries, bars, supply stores and inns. The town’s smugglers would sail off at night with ropes dragging huge cylinders of liquor behind them. If the American Coast Guard pursued, they would simply cut the ropes, wait for the patrol to leave, then recover them. But just as it was during the Civil War, as soon as the US repealed the ban in 1933, the economy took a dive and people started fishing again. It was only when the island developed as the quintessential tropical Caribbean playground that the fickleness of the economy would change for good. That happened when a financier from the state of Virginia named Wallace Groves, who has been on the island since the mid-1940s, saw its potential as a tourist destination. In 1955 he approached the Bahamian government with his idea to build a town that catered to both industry and tourists. Shortly after, a famous document known as the Hawksbill Creek Agreement was signed, and Freeport was born. adding an additional 50,000. To encourage investment, it also freed the port authority from paying taxes on income, capital gains, real estate and private property until 1985 – a provision that has since been extended to the year 2054. Soon after the agreement was signed, Groves began to enact his vision. He convinced the shipping tycoon D.K. Ludwig to construct a harbour, and in 1962 he brought in Canadian Louis Chesler to develop the tourist centre of Lucaya. More than 40 years later, the result is a community completely tailored to the getaway tourist, an island offering almost every kind of vacation activity imaginable. For nature lovers the splendours of the Lucayan National Park and Garden of the Groves are part of the island’s new allure. Over the past two decades, as some development stalled, there has been an increasing trend towards ecotourism. The ground was laid in the late 1960s when the Underwater Explorers Society (Unexso), focusing on the island’s marine treasures, began offering recreational dives near Lucaya. About the same time, the Bahamas National Trust gave the world Lucayan National Park, some 30 miles east of Lucaya. Its 40 acres encompass the doorway to one of the world’s longest mapped underground cave systems, home to nesting bats in summer and a new species of crustaceans. Today, Ministry of Tourism officials have encompassed the whole of Grand Bahama Island in a new, all-inclusive programme called Club Grand Bahama, which allows visitors to purchase a ‘smart card’ for certain island activities and restaurants. With the reopening of Garden of the Groves in late 2008, the island took another important step down the ecotourism trail. The attraction first opened in the 1970s and was later bought by Miami’s Parrot Jungle operation. It closed after hurricanes Frances and Jeanne hit in 2004. Today, it’s back, better than ever. Its signature chapel still looks down upon the gardens. A sprawling outdoor café with multiple decks and a charming shopping village are new, as is the Labyrinth, a walking meditation path that follows the design of Chartres cathedral in France. The riotously lush garden’s 12 acres showcase Bahamian trees, such as lignum vitae (the national tree), powderpuff, silver trumpet, royal poinciana, mahogany and black olive.